Describe this Piece: This is perhaps my most popular and most publicized work. Created in 2010 and made up of around 5 layers of acrylic paint ranging from darkest bleu/turquoise to light blue and white. It is inspired by nature the artist & sculptor carving rocks and creating new forms over thousands of years. There is some beautiful art here, I must explore! Breathtaking, Refreshing, great work ! Thank you Allan for sharing your master piece with us, I love it, I’m great lover of realistic painting because thus my style. You really inspired me a lot. of his work. I spell my first name Alan also, it is unusual. Allan you did a real great work ..love this stunning painting !!! Oh My! What an awsome piece of work. Thanks friends, your comments here really made me smile. You can contact me anytime, and it would be great to hear from you even just to say hello. I have a large portfolio of my work too online and paint oceans and marine wildlife full time. This is a really lovely painting of the ocean. I am a lover of ocean paintings. 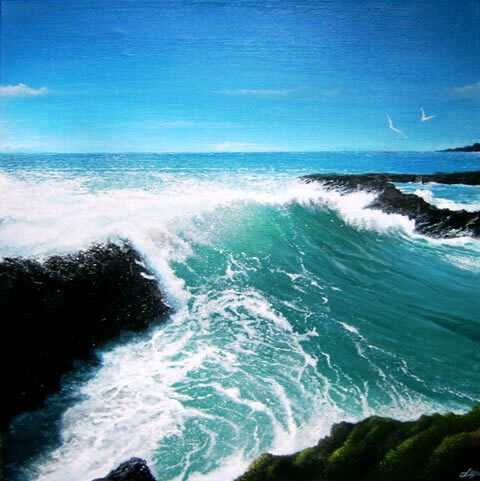 Are there any book that you recommend intermediate level artists who are interested in learning how to paint the ocean?